Rumors regarding Apple’s (s aapl) plans for a new, smaller tablet got resurfaced on Friday, thanks to new reports from the component supply chain via DigiTimes. 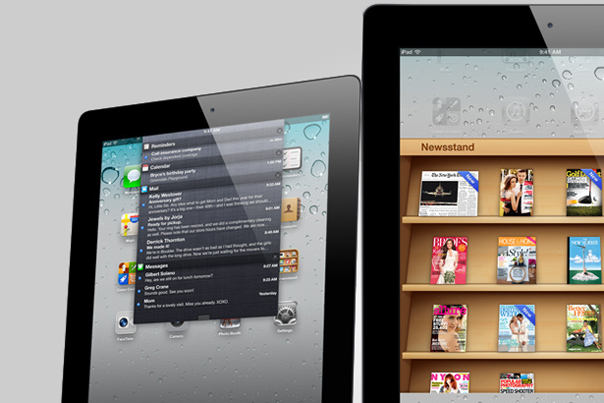 The site says Apple will likely introduce a 7.85-inch iPad before the fourth quarter of 2012. The release of an “iPad mini,” as many have dubbed such a device, would follow an early 2012 release of the iPad 3, which the supply chain sources said would indeed come by the end of the first quarter of 2012, as reports have suggested. The smaller form factor released later in the year is intended as a way to “cope with increasing market competition, including the 7-inch Kindle Fire,” according to DigiTimes’ sources. Former CEO Steve Jobs had previously expressed the belief that a 7-inch tablet was simply too small, owing to software development concerns, but DigiTimes says the Amazon(s amzn) tablet along with large-screen smartphones coming to market (like the Galaxy Note) have caused Apple to change its position on the matter. Apple will source the 7.85-inch panels needed for the device from LG Display and AU Optronics, the sources told the publication, with production intended to get underway “at the end of the second quarter of 2012.” Back in October, we heard that LG Display and AU Optronics had both sent samples of a 7.85-inch display to Apple for early testing and approval, a report which originally stemmed from the Economic Daily News. The displays reportedly had the same resolution as the iPad 2’s screen, which should ease the software conversion process for developers. I think if Amazon has demonstrated anything this year, it’s that Apple could really make a splash with a smaller, cheaper tablet arriving just in time for Christmas 2012. We’ll see if these early reports end up resulting in anything tangible, but I’ve noted before that there are strong reasons to believe they will, and Amazon’s early success with its low-cost Kindle Fire adds considerably to that argument. The 7.85″ screen is a controller/remote for an A5 powered AppleTV or flatscreen Apple television, primary wireless network BT4. Will have WiFi (but no 3G or LTE) & 2ndary touch controls on the back, and work alternately as a mini iPad. man does apple love milking their customers. How about a apple device that can load a flash website? Does Apple absolutely need to do this? No. But should they do it? Yes. Don’t quote me how apple has said that they don’t’ think the interface works at a smaller form factor. Will it be a less splendiferous experience than using a full-sized iPad? Sure. But will it be a disaster? Absolutely not. Is the iPhone’s small screen experience a disaster? Far from it. There’s absolutely room in the market (and customer demand) for a screen size in between those two form factors. First, there’s the fact that the standard iPad is just too big for many folks who are on the go all day long. And I have been told point blank by many women that one of the key reasons they love their kindle is because how it fits in their purse. Similarly, nearly as many women have told me that they find the iPad just a little too bulky for them. Then there are kids: Rugrats love iPads. But few of them can be trusted with a $500 device. And if you’ve got more than one kid, are you really going to spend $1k for them to have matching tablets? No way. But $600 for two kids to be happy is almost reasonable. Then there’s the demand for iPads as mobile DVD player replacements for families and kids. Nobody wants to spend $500 to do that in the car when a mobile DVD player solution can do it for less than $200. Butâ€¦ If you could get an iPad for $300â€¦ Hmmmâ€¦ that changes things. And then there’s the mobile electronics industry as a whole. I can guarantee you that you will see an absolute explosion of iPad-in-the-car installations when Apple releases a smaller iPad. Because it could then be integrated into headrests and (more importantly), be built into a dashboard more easily than the standard iPad (yes, disbelievers, there is a MASSIVE demand for tablets in the dashboards of cars). And then there are the folks for whom $500 is a massive amount of money (nearly as much as their rent). It’s a purchase that they simply cannot justify. But $300, now hmmm, well they could perhaps actually manage to save that up over, say, 6 months. I am an owner of an iPad 2, and as I write this, I have a Kindle Fire next to me that I’m evaluating. In my opinion, the Fire has a lot of software issues that need work, and the placement of the power button is unfortunate. However, the physical size of the device is perfect. I can fit it in both my pants or my jacket pocket. If I could get an iPad in this size, I would sell the iPad 2. I agree completely with this comment. I too would sell my current iPad and get the smaller one. I agree. I have used the iPad2 and Android tablets simultaneously, and I would take a 7-inch iPad in a second, over any other tablet. I’ll believe that when my poop turns purple! I’m curious how they are being “forced” to enter this form factor, when the iPhone still handily outsells every Android Model, and the iPad is essentially a monopoly on the tablet market. So far, their positions are being validated. Unless it fits into my sport coat pocket, it will be as transportable/useful as the current ipad — that is, sitting on my bed nightstand until/unless I carry a briefcase with me – joy. You neglect the purse carriers :D I love my 7″ droid tablet but would happily replace with its more robust iPad equivalent. Dont want to read on a tiny phone either. Key questions, no answers, nor any expected. At what aspect ratio and pixel density? At first I thought this was a joke, but then I realized that I was on Gigaom.com. I still can’t believe that Apple would want to make a smaller tablet given that they ARE the tablet market and the phenomenal success of the iPad 2. What I can see Apple doing, however, is releasing the iPad 3 at the same price as the iPad 2 is currently selling and then offering the iPad 2 at a discount, much like Apple has done with the iPhone 4 vs. 4S. Or what Apple could do is release iPad 3 with the larger 9.7″ hi-res Retina Display at the same $499 starting price and have a lower-priced 7.85″ iPad with the same 1024×768 resolution as the iPad 2 with say a $299 starting price.